Doreen was in the SLI Paris program in 1970 and remembers the notice on a brick wall near the Foyer des Jeunes Filles, saying "22 mai. Tous dans la rue." Revolution was in the air. Doreen "would like to hear from Susan and Sharon and Nancy and Evie." She earned a JD at UMKC and practiced law 7 years, then started an "extremely extended maternity leave." She and Scott have 2 children, 17 and 24. Jana earned her BA in French in 1981 and continued graduate studies in Anthropology. Spent her Junior Year in Bordeaux on the Colorado/KU program, and had an internship in 1981-82 with Service Chrétien d'Haiti, arranged by Prof. Freeman, then was KU Graduate Exchange student in Strasbourg and earned a Licence in ethnology. Earned a JD at the University of Florida and has utilized her Haitian Creole doing pro bono immigration work in South Florida. Janet earned her BA in French in 1978. She was in France twice through KU programs: summer of 1975 on the SLI, 1976-77 on the exchange program in Bordeaux and she has great memories of both programs, also of her honors classes in her senior year, especially the films of Jean Renoir. Earned an MA in French at the University of South Carolina, doing a thesis on Mauriac. She worked as a bilingual secretary in NYC for a few years, then was married and relocated to Virginia, then Maryland, where she completed an Associate's Degree in Applied Science in Nursing. Worked as an RN for five years, now back in Kansas City with her husband and son, and is a homemaker enjoying time with her son. Margriet earned her PhD at KU on May 23, 1972, same day as her husband Gregg Lacy (they have been divorced since 1982) and started a twenty-year stint at North Dakota State University-from part-time lecturer to professor, to department chair, to dean of the College of Humanities and Social Sciences. She has been at Butler University in Indianapolis since 1992, first as dean of CLAS, then-since 1998-as University Professor. She plans on retiring in 2002, but will undoubtedly remain active in the American Association for Netherlandic Studies and in her scholarly work on Belle van Zuylen/Madame de Charrière (still likes Mauriac--her dissertation subject-but does not work on him any longer). Vicki earned her degree in French and Geology in 1973, then went on for an MS in Geology at the University of Washington and worked as a geologist for many years before becoming a full-time homemaker and community volunteer. Susan answered us with a good long letter from Rio Rancho, NM, where (having completed an MD at the KUMC and further training in Corpus Christi, TX and Methodist Medical Center in Dallas, rheumatology residency at U Texas SW Medical School) she is with a model medical organization, Lovelace Medical Center. She married Rick Gangemi, a human resources professional, in 1985; his daughter Tricia "produced our first grandchild one year ago." Rick's work has taken him far and wide and Susan has joined him as often as possible: London, Frankfurt, Baden-Baden, Singapore. They plan on visiting Italy soon and France soon after that. Jackie was the Director of the KU performing arts program for over 20 years. She was in that position when our new Lied Center was opened in 1993, and saw the growth of the program from two series to six in 2000 when she left KU to take a new position at the Lincoln Center in NY. She used her French at conferences in the Ivory Coast and France, and developed a relationship with the French Embassy cultural office in NY. She was inducted into the KU Women's Hall of Fame in 2000. As many from her time at KU, she remarked on the "community" spirit of the graduate students, who studied together and shared meals. Soon after earning her PhD with us, Claire took a position at that institution west of Topeka where they wear purple. She has had a productive professional career, publishing one book in 1989 and finishing another one as she wrote us, both on the African novel. She had many kind words to say about the department and particular professors who encouraged her to continue her studies, and continued to support her after she completed the doctorate. This is worth quoting in full: "As for stories about the place, two come to mind. First how I was hired: one Sunday evening in February, John Williams called me and asked if I were interested in teaching French. Between that and glueing feathers on Hallmark cards, I chose the former. The next day at 11:30 I was teaching French to a French 2 honors. I had no idea what an American University was like [Claire was born and raised in Belgium]; I had never taught in my life. I am convinced those students learned French by themselves. [Not true; Claire learned fast how to teach.] The second story gives the depth of my naiveté. In those days (1968), the department was "lodged" in the [former] dormitory, Carruth O'Leary. When I visited it, I did not know that detail, and marveled at how clean these Americans were-they have showers even in their office building!" 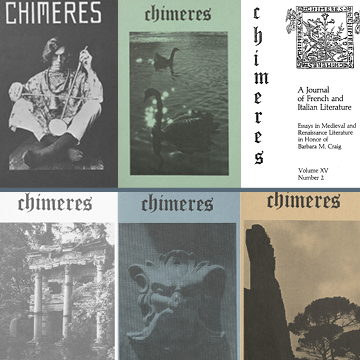 Claire worked on Chimères for a long time and remembers fondly her colleagues: Lloyd Free, Isabelle Armitage, the Pensecs, the Runtes, Joe Crivelli, the Lacys, Steve Gordon, Jerry Nash, "and company." Susan earned her degree in Education with French and Spanish, but has not taught. Enjoyed using her French when traveling. Having done Journalism as well as French (and grad work in Poli Sci), Kenna worked for a couple of papers early: the Alexandria (LA) Daily Town Talk, and the Jennings Daily News (also LA, in the heart of Cajun country). Then on to Law School in Houston and worked at a number of firms, then to Laredo in '95 (using her Spanish). A trip to Paris in '99 on an organ tour proved that she had not lost her French. When she wrote she was working on an MM in organ performance and using her French still more. Grace has been a speech language pathologist for some time and also active in her teachers' association. Married, with a daughter [we met both husband and daughter because her reply happened to coincide with our departure for France and theirs-so we got together for a short visit in Brittany]. Grace's memories of the SLI (1972, with both Corinne and Bob Anderson as "chaperones" - apparently that term was used regularly in the past, not today) were typical: "life-changing experience." She has traveled extensively since then, and credits that experience as the motivating force for her passion for travel. Dan made it easy for the typist: only news is that he obviously went on to Med School. I wonder if he's using his French at all in Blue Springs? After working many years as an editor of the International Herald Tribune, she now works part-time for the Hérald, devoting the rest of her time to writing poetry. She lives in a small Buddhist community with her family in Paris. [That information came in a later e-mail. First response gave much information, summarized here.] She was glad Bob Anderson passed on her address (not in our files originally), especially since her experience with the SLI, directed by him in 1980 (travel part), was so important in setting her career. Great memories of the SLI, both the travel part and the Paris part; that was in the days that they stayed at the Maison des étudiants on Vaugirard, and took classes at the Sorbonne. She came back to KU from that summer and took more French while finishing her Journalism degree. Next had the grad fellowship to Clermont-Ferrand, and stayed....Has two children, "both bilingual dual nationals whose fathers are French, and myself often have a more French sensibility than an American one." Cynthia married a Brooklynite. Her step-daughter spent two weeks in France in 1999 with students from her HS, but Cynthia's last trip to Paris was a week's vacation many years ago. She works in the Compliance Department at Lutheran Brotherhood [Minneapolis: must be Prairie Home Companion fan?]. A fanatic reader and singer like her husband, she still picks up L'Express from time to time, recalling her experience in the first current events course in which that magazine was used (the year that Giscard was elected). Dianne's e-mail response in May 2000 made the point that she had never received her diploma, despite two requests (with payment). I tried to correct that error, but have heard nothing: sorry, Dianne. She was a student both in French and in Linguistics, and went on the KU/Colorado exchange program to Bordeaux in 1972-73. Her first job after college was for Travelodge International, a subsidiary of Trust House Forte, as multi-lingual reservationist (German and French). She was soon the Co-Coordinator of a Visitors' Translation and Info Program called "VISIT USA." Unfortunately, that service no longer exists, unfortunate "because it was always interesting and we really helped people." Among other anecdotes, this one stands out: "One couple from Paris were so consistently lost, calling as many as 5 times a day, that I just said, 'Come to Kansas City and let me watch over you for a little while.' Driving them to my parents home in El Dorado, for a home-style steak and potatoes dinner, they marveled over the desolation of the Flint Hills. I told them that was ranching territory-where the cowboys are. Then they needed to know 'mais où sont les vaches?' Since there were very few cows in the fields at that time, I'm not certain it really sank in just how vast that mostly-empty stretch was." As for her experience in Bordeaux, she mentions that she regrets she did not "have a palette to appreciate some of the truly fine wines we were allowed to taste....Now that I really enjoy dry red wines, I cannot find them in my price range. I was spoiled too soon!" Janet was on the Bordeaux program, 1972-73 and says, as so many do, "[it] changed my life." Further, "I still correspond with the French family that was assigned to me by Monique Du Voisin. I visited them in Talence and their daughter's family in Paris in 1995 with my family." She asked for the address of Beth Gurney, also on that program, and Joe & Marie Eygun, who helped Monique. We could not help her: if you can, please write us. Since leaving KU, Janet has taught at the secondary level, served as an interpreter, and taught in a "French for Beginners After School Program." Mary Gay earned a BA with honors in French, along with a BS in Education, in 1972, then completed course work for an MA with us, while teaching as a GTA. She and her husband, also a loyal Jayhawk, moved to Illinois in 1974 and have lived and worked there since. She found teaching jobs right away in secondary schools. After replacing a teacher who was on maternity leave, Mary Gay took her own maternity leave for the birth of her daughter on Christmas day, 1975. 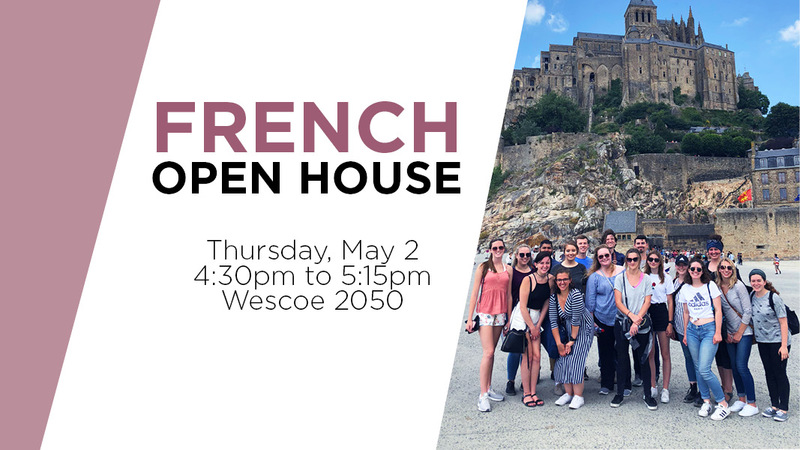 Later, she taught at Bradley University for 6 years, then started a new junior high program in La Grange-and during her years in that school district, took six groups of students to France. Recently, she has been tutoring business people and their families planning to move to a francophone country, as well as tutoring in ESL. One of her highlight experiences while at Bradley was to translate on NBC TV on the occasion of François Mitterrand's visit to the farm of the Secy of Agriculture. Mary sent us a long and informative response and much of it will be useful for the history I promise to write; for the moment, I include one other memory: "typing Proust Research Association Newsletters for Ted Johnson and L'esprit créateur for John Erickson. Yes, the IBM Selectric was 'state of the art' and we used dittos and stencils to copy tests for classes." [David made contact with us to request the address of his instructor in French Honors in 1971-72, Barbara THOMPSON, whom he wanted to thank for her excellent teaching back then. Now a professor of Psychology at SW Mo State, he knows-as many of us do-how much it means to have a former student remark on the impact we've had. Since he was not a French major, we did not have David in our data base-I'm sure there are many other non-majors we would enjoy hearing from. Barbara, when least contacted, was teaching at Sumner Academy in KC. John was here originally in 1965-66 on an NDEA fellowship, then taught for a year in HS before being drafted. After two years in the US Army, he returned to KU on a teaching assistantship and kept that through 1976, with a one-year break in France (1970-71). He was hired at the University of Wisconsin-La Crosse in Fall 1976 and has been there ever since. He is currently Dean of the College of Liberal Studies, and-despite hopes to get back to full-time teaching-fears he'll be at that until retirement. He had this comment about his year in France: "I had been awarded a Fulbright for that year but the awards were not funded, so the French government hired us as assistants d'anglais. I was assigned to the Lycée in the suburb of Saint-Cloud. The big discussion when I arrived was whether or not I would be required to use a British accent in my classes. It was finally decided (after a three hour meeting of the English faculty) to call me the assistant d'américain and allow me to use my native accent." After a BA (French) and BS (Educ), Barbara went on to medical school, completing her MD at the KU Med Ctr in 1986, then a surgical internship in Boston and anaesthesia and pain studies at Dartmouth. She is currently in private practice in Vancouver. She did her junior year abroad in 1973-74 at Bordeaux and "would love to know what the other folks from my junior year abroad are up to." Anne went on from KU to Yale Divinity School and returned to KU to serve as the chaplain at Canterbury House from 1986-90; she is now at St. Mark's Episcopal Cathedral in Minneapolis. A very good friend of Barbara Craig's, she was-the day after her ordination-able to celebrate and administer Communion to her, at her hospital bedside, just a short time before her death. [I know that Barbara was very happy about that.] Aside from warm memories of Barbara Craig, Anne particularly mentioned Ted Johnson's great enthusiasm and understanding of how all things are connected to everything else. Janet was in our Intensive French (16hr) course and went on the SLI in 1972; she met an Austrian in Paris, wrote to him for 4 years and married him in 1977. They live in Austria, have two daughters, 14 and 19, and travel extensively in Europe. It was very good to have her comments about the intensive French course and the value of hard work, learning vocabulary and attempting to "saturate" herself in the culture. She has added German, of course, and Italian to her language list and has used that competence in her nursing work (Nursing degree from Wichita, earned after KU). Sue graduated in May 1974, got married, and moved to Texas all within a two-week period. She taught HS there for a number of years, while adding a certificate in English to her MS in French and Spanish, and having two children, Deanna (1976) and Danay (1979). The family moved back up to Blue Springs to be near family, but soon returned to Texas, where they were when Sue wrote. In 1983 she began teaching at Brazesport Christian School and was beginning her 18th year there in 2000, and very happy. She had developed their Spanish program to the point they were offering Spanish IV Advanced Placement. Unfortunately, not a large enough school to offer French as well, especially considering the need for Spanish. Her husband's job has given her many opportunities to travel: Belgium, England, China, and in 1999 the family and some of her students went on a mission to Mexico. Sue has very good memories of her classes at KU, challenging and interesting. And her experience with the SLI in 1971 especially stands out. She remembers a fairly "lively" group of students, making life a bit stressed for the Andersons, who were leading the group that year. Her stories of the girls' dorm contrast with those of students in later SLIs (coed dorms, better accommodations, and much more lax rules): "[Madame Martin] turned on the hot water for showers one hour each day, usually around 4:30 p.m. when no one was there. When our sponsor asked her to extend curfew or let her have a key, her response was 'Ca ne se fait pas! I think that was Bastille Day and we ended up spending the night in the piano room of the boys' dorm." [This entry is the result of my mentioning to Tom Booker over coffee that I was sorry we had obviously missed many people, including some who are probably close by and/or with whom we've had contact without thinking to ask them for the basic info; he asked if I'd checked with Rosalea, now in our Dept of Spanish & Ptg....] Rosalea was a Spanish and German major at KU, and went on for a PhD in Hispanic Literature at Cornell, taught Spanish at the University of Tulsa, then came back to KU 10 years ago, as director of the KU basic Spanish Language Program [one of the good people in the world!]. She is married, has three small children. Despite the major in those other languages, Rosalea took French here: "I was fortunate that Prof Booker was my instructor for FREN I and IV. At that time I didn't know I'd be a language teacher. Wish I'd been analyzing his techniques as much as I was paying attention to the French." She was on the 1977 SLI and turned 21 at Carnac. Met her French penpal (correspondence arranged by Martha Perrigaud Dupêcher) in Paris and they STILL correspond several times a year: that comes to 26 years. She points out that she was in Paris when Elvis died [he did die, by the way], "although, of course, he was totally uncool at that time." While in Paris, she tracked down locations mentioned in her FREN IV textbook. Tom was not a French major, so we did not contact him via the original letter plus questionnaire. He wrote an article for HORIZONS, a newsletter for international programs at KU, about his year in Bordeaux and I read it and wrote him. He later came to visit the campus-he has been in regular contact with the Study Abroad office and has given them much support-and gave me lots of information and realia about Bordeaux. I followed up in the final days of completing this project and he sent me more personal info. Although he majored in Math at KU, he was very much interested in French and took two courses here, including the literature and composition course (probably what is currently FREN 326, first course for the major), and spent 1971-72 in Bordeaux. There were nine other KU students, and about 50 total. "It was the most important episode in my entire undergraduate or graduate education, as it gave me a new perspective on the world and has served me well both in my career and in my personal life. His career, after earning an MS in Computer Science at the University of Wisconsin, has been in software development. One of the original developers of PowerPoint. After 20 years of full-time work in that field, he went into semi-retirement in 1996, but is still obviously very active-and giving much time to KU and study abroad. Currently on the Advisory Board and the KU First Campaign Committee for Study Abroad . Fauzi went to Portland State University after his Business and French studies at KU, and studied Information Systems. He has been back in Lawrence since 1997, commuting to a job in Topeka as a data analyst; he feels that his French studies helped him to read fast and sharpened his skills to analyze a situation and go to the roots. Greg earned a BA in French here, but then went on in Linguistics at Ohio State University, earning his PhD in 1981. During that time, he married Marcia Hurlow, and their daughter Marjorie was born. He took a position in English/Linguistics at the University of Kentucky soon after completing his doctorate and has been there ever since (tenure in 1986). [I had the pleasure of seeing him at the KFLC there some years ago.] He has used his French professionally, writing Linguistics articles on French morphosyntax and working in Brittany on Breton morphology (French was the metalanguage with his Breton-speaking informants). Greg especially remembers literature courses with Barbara Craig, Bob Anderson, John Erickson, and Ted Johnson: when John was hired at the University of Kentucky, Greg caught up to him in the hall and recited Le Tombeau d'Edgar Poe, a sonnet he had memorized for John's course in 1975. Lynn majored in French here, graduating in 1979 (after a Junior Year in Paris with the NYU program); then she earned a law degree here in 1984 and had a 12-year career in corporate trust, leaving an important position in 1996 to return to French literature, first at Bryn Mawr (MA in 1997), then at Princeton. Had a tentative dissertation title when she wrote us in April 2000. She and her daughter were living at that time in a suburb of Reading, PA. Lynn has fond memories of KU and her professors and credits them for encouraging her studies in French. Kaye earned a BS in Secondary Education (French and Spanish) in 1972 and studied at the Sorbonne (Cours de civilisation...same one we used to use for the SLI) in the summer of 1970. She and her husband Walter have three children, all of whom came back to KU (Journalism, Business, Broadcast Journalism). Kaye has been teaching at St Thomas Aquinas HS in Overland Park since 1991, more Spanish than French, and-when she replied to our questionnaire-was working on an MA in Liberal Arts through Baker University (Baldwin, KS). Pat earned both an MA and PhD in French here, marching down the hill for the PhD with Marie-Luce Parker. She retired in 1997 after teaching for many years at Emporia State, and had moved to Topeka. Only one of her sons and family are close by, so she notes how happy we [i.e. David & Nancy Dinneen] must be to have children and grandchildren all in Lawrence. Pat traveled extensively, "to France about a dozen times, sometimes taking students or granddaughters, more often alone." When she wrote she was looking forward to a choir trip to Italy and later a trip to France with a grandson. She has fond memories of KU and wonders what happened to Anne Lacombe and Lee Gerstenhaber. . [Others have asked about both of them; we have no recent information, no addresses.